Honorius, his pearl diademed, draped and cuirassed bust right. Emperor advancing on horseback right, raising right hand. Minted at the 3rd officina (Γ) in Antioch (Antakya, Turkey) between 22 January 393 and 17 January 395 A.D.
Pearce, J.W.E., "The Roman Imperial Coinage", Volume 9 (RIC), Antiochia, p295, nr. 69e. hinterlassenen Sammlung und Aufzeichnung des Herrn Paul Gerin" (Voetter-Gerin), Antiochia, Honorius, p58, nr. 3. Carson, R.A.G., Hill, P.V., & Kent, J.P.C., "Late Roman Bronze Coinage", (LRBC) Part II, p102, .nr 2789. Sear, David R., "Roman Coins and their Values" (RCV 4th Revised Edition), p358, nr. 4254, variety from Antioch. Cohen, H, "Descriptions Historique des Monnaies frappees sous l'Empire Romain" (C), Volume 8, p181 , nr. 23. 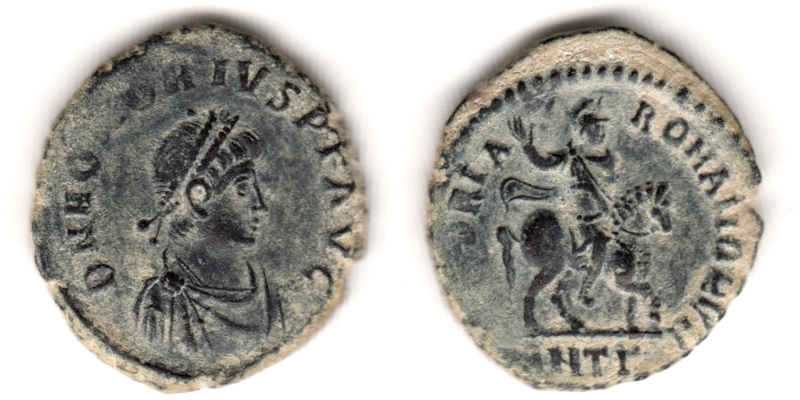 Van Meter, D., "Handbook of Roman Imperial Coins", p318, nr 38.